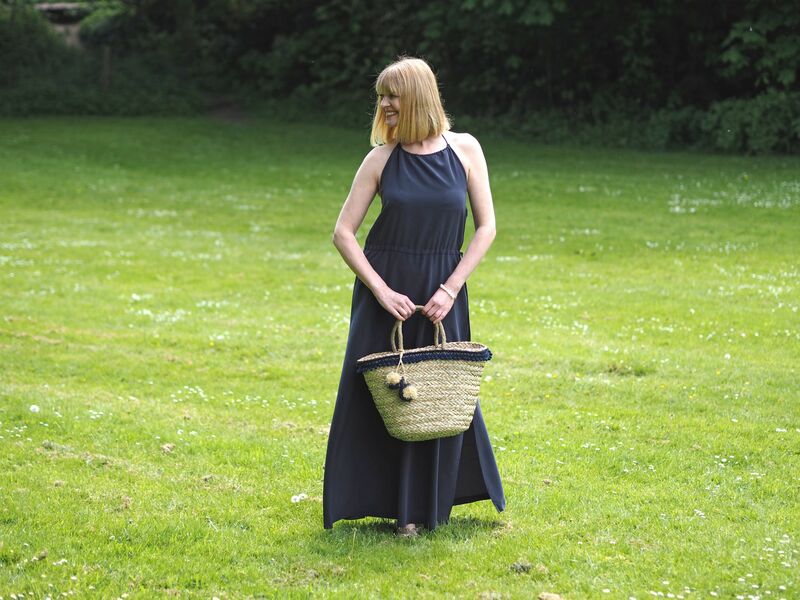 Silk Navy Maxi Dress: Versatile, Elegant, Chic. Once in a while I step away from the florals in favour of a rather different type of dress. A dress whose very simplicity is enough to make a statement. A whispered statement. This silk navy maxi dress from The White Company is the epitome of understated elegance. It’s chic, elegant and timeless. I’ll be wearing it on repeat. How perfect it is for weddings, proms, days at the races and cocktails. Equally though, it’s ideal for shopping, for travelling, for lunching and brunching, for picnics and barbecues. It’s made of a beautiful washed silk so it feels divine against the skin. It’s machine washable and is bra-friendly. This navy maxi dress therefore, is as practical as it is sophisticated. In fact, I can’t think of anything more I’d ask of a dress. It fastens with an adjustable halter-neck tie and has a drawstring tie at the waist. The side slits make for easy swooshing and they give it a fluidity when moving. I “demonstrated” this dress on Instagram stories. It’s still there in the “Daily Outfit” highlights. This is the link. Please scroll through to see me showing the back and how it’s bra-friend and to see the slits at the side. 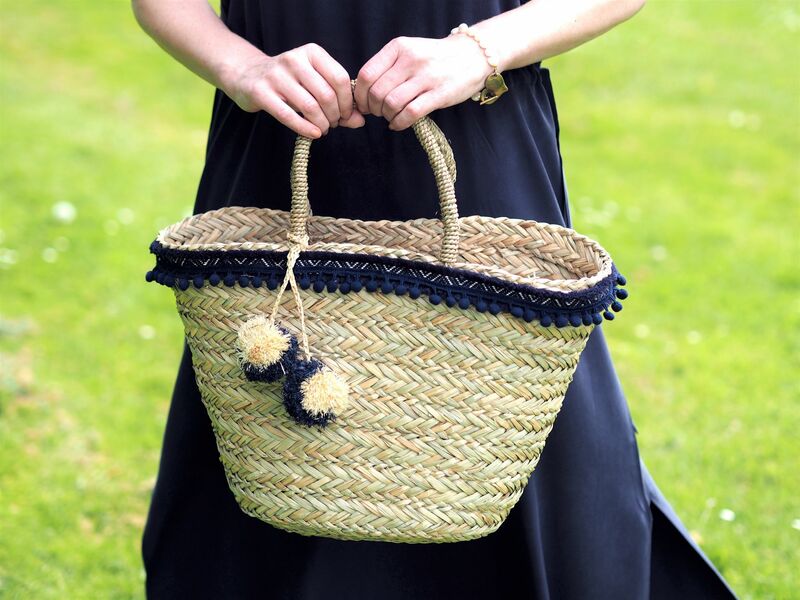 The straw pom pom trim basket bag is also from The White Company. I chose it because of the navy trim but also because of the useful size. It’s not so capacious that it’s impractical for everyday use, but it’s large enough as a beach bag and as a shopping bag. I like it for storage too. It’d make lovely towel storage, for example. The large pom poms are detachable, but mine will definitely be staying put. I’ve had straw bags and baskets in the past which have been quite rough and which have scratched my arms and even plucked my clothing. This straw basket is smooth though, and, as one would expect from The White Company, very well made. I suspect that Meghan’s chic, elegant wardrobe will have a huge influence on the way we dress. Her clothes are usually monochrome and from a neutral palette, and she favours a high neckline. Her wedding dress and the one she wore to the evening wedding reception were pared down and understated, as was the navy dress she wore the evening before her wedding. They needed few if any accessories and very natural make up. Natural beauty and innate style at its best. I’d like to think that my silk maxi dress with its high halter neckline would get the Meghan seal of approval. The White Company has been my go-to place for towels and bedding for years and years now. I love their candles too and would probably say that their Winter one is among my all time favourites. The clothing and accessories are all beautiful. Because they’re understated, they have a timeless look and feel to them. The neutral palette of whites, greys, black and navy makes it incredibly easy to build a sophisticated wardrobe that can be added to with pops of colour, prints, metallics and more neutrals. 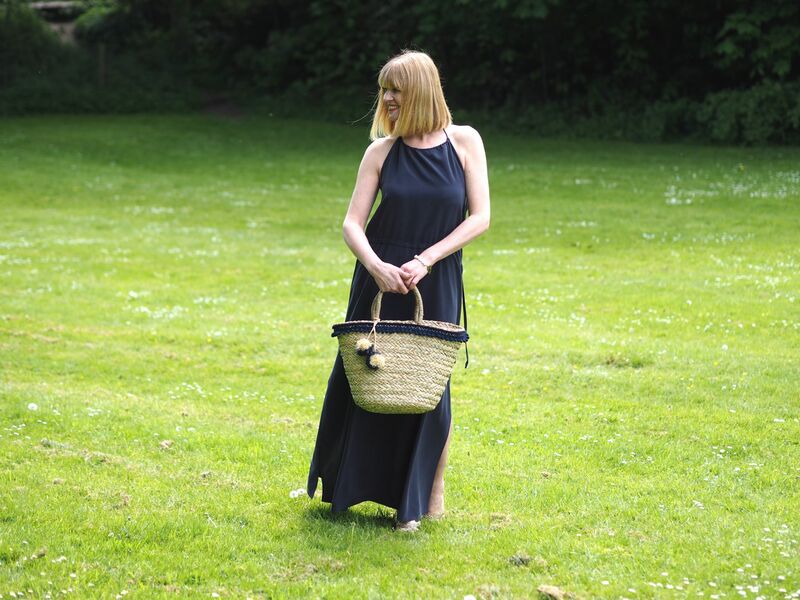 Alongside this beautiful navy maxi dress and basket, I have my eye on a few more pieces that would make perfect additions to my neutral holiday wardrobe. This post is a collaboration with The White Company and they have given me a special discount code to pass on. Simply use LIZZYLOVES15 for 15% off full-priced items when you spend over £50. (T&C’s: Offer is valid on full-priced items only and cannot be used in conjunction with any other offer. Standard free UK delivery is valid for online, telephone and store mail orders to the UK mainland only when you spend £50 or more. Offer excludes gift wrap, gift vouchers, all furniture, beds, mattresses, upholstery and made-to-order items. Offer is not valid in clearance stores. To redeem this offer in store you must present this code or show it on your mobile device. Offer ends midnight 19th June 2018). My dress and the pom pom basket were gifts from The White Company and the links to these products are affiliate links. This means I get a very small commission should you click through and buy from the website. It isn't a sponsored post though and all opinions are 100% honest and all content is my own. Thank you for supporting those brands that support my blog and me. Previous Post Coral And Red Holiday Wardrobe Additions. I just had to stop by and say how divine this looks on you Lizzy! I’m a huge fan of The White Company too! Such a beautiful dress Lizzy! And the pictures are superb! 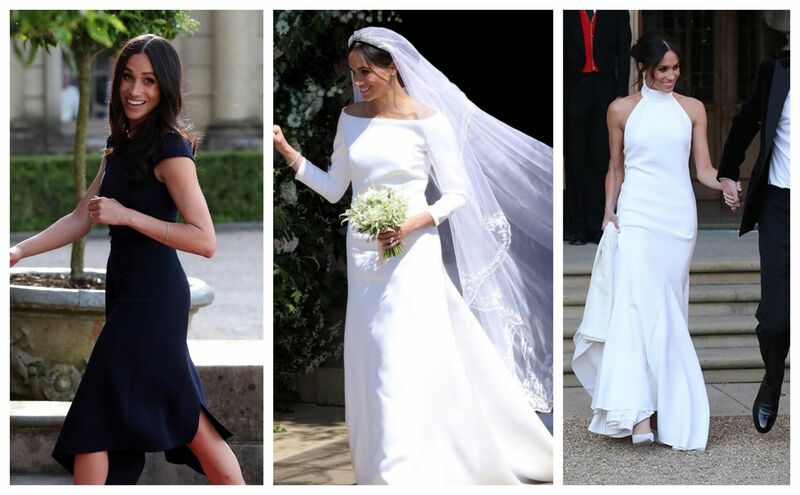 Lovely dress, Lizzy, but we shouldn’t be fashion slaves and follow the crowd like obedient sheep, wearing whatever Meghan Markle is donning. What a fabulous dress, Lizzy! It looks perfect for the summer time. I love browsing in The White Company – the smell always gets me when I first step inside. They have such beautiful quality things for sale. I’m not usually one for the simple and understated look, but this is divine Lizzy. You carry it of so well and have sold the practicality of this maxi to us all, I’m sure. Nice dress. What kind of bra are you wearing? Because of bra firendly but I don’t see any.